This is my Mama’s recipe. Whenever she gave us a choice of meat vs cheese filling, I picked this one. However, savory crepes take considerably longer than the cheese crepes I posted earlier but they are definitely worth a try. That might be why I see more of the cheese filled ones at our church potlucks. 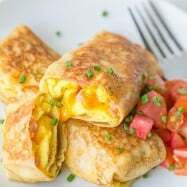 Note: If you haven’t tried the cheese-filled crepes, you will come to find out why they are the best breakfast food known to me; truly a wonderful treat! Ok, getting back on track… I won my husband over with this recipe. He thought they were delicious. 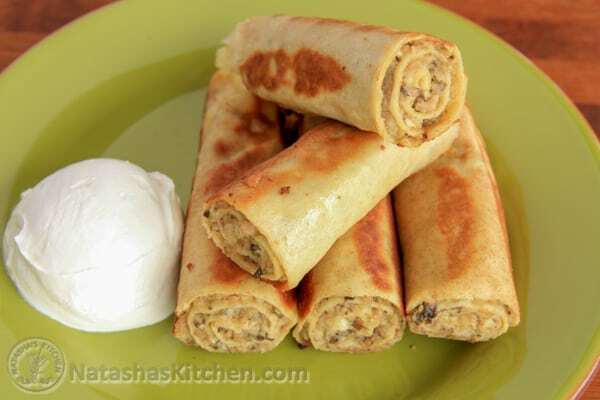 My son also enjoyed these meat-filled nalesniki (drenched in sour cream of course). They are both chicken and potatoes kinda guys, or shall I say, savory crepes kinda guys. F.Y.I. 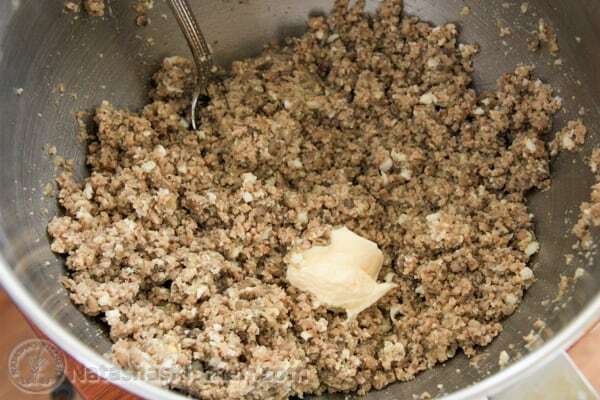 a Meat Grinder or a good food processor works best for this recipe. 4 Tbsp unsalted butter, melted. Plus more to sauté. Make the filling first. 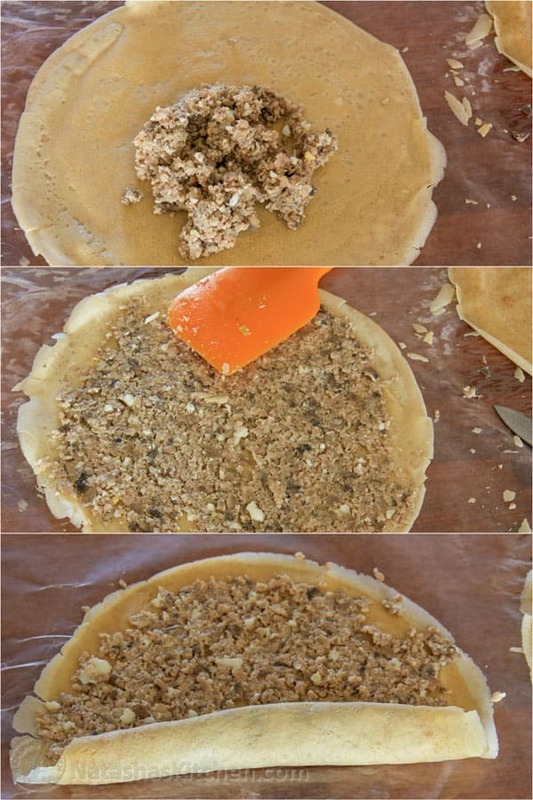 You can even make the filling a day ahead and refrigerate. 1. Boil the eggs in a small pot until fully cooked through. Place in cold water to cool them down, then remove the shells. 3. 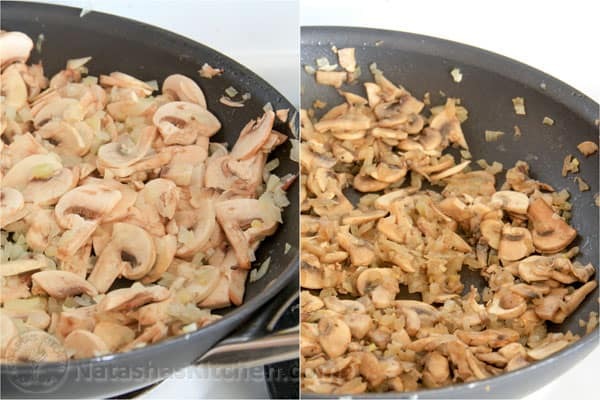 In the same skillet, over medium/high heat, saute mushrooms and onions with 1/2 tsp salt and 1/4 tsp pepper. Add to the mixing bowl with meat. 4. Add 3 boiled eggs to the bowl (cut them in half so they go through the meat grinder easier). 6. Stir in 1 Tbsp mayo OR water to make it a little more spreadable. 1. 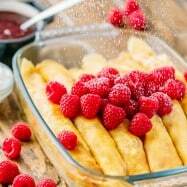 Put all of the ingredients for the crepes (in the order that they are listed: 1/2 cup warm water, 1 cup milk, 4 large eggs, 4 tbsp melted butter, 1 cup flour) in a blender and blend until well combined. 2. Melt a dot of butter in 2 non-stick skillets over medium heat (2 skillets make the process go faster). Pour enough batter to cover almost half the bottom of the skillet and immediately swirl around to evenly coat the bottom of the pan. If you get any small gaps, you can fill them with more batter. Once the bottom is barely golden, flip the crepe using a sharp edged spatula to easily get under the crepe. Let the other side get golden and plop the crepe out onto a cutting board. Repeat with all of the batter, using a dot of butter each time if needed (it all depends on your skillet). Don’t stack hot crepes on top of each other. Once they are just warm or room temp, they can be stacked. Don’t panic, the first crepe in the pan never turns out nice! 3. 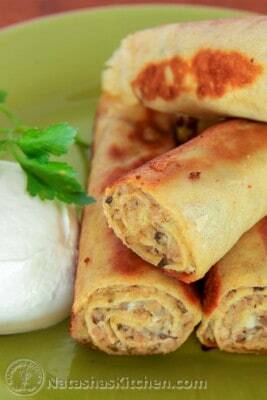 Add enough of the meat mix to be able to spread a thin layer on the crepe. 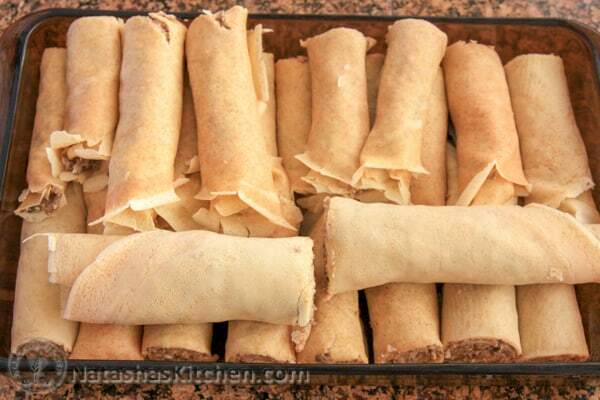 Roll the crepes and cut in half if desired. Refrigerate crepes that aren’t being served. It keeps in the fridge for almost one week. 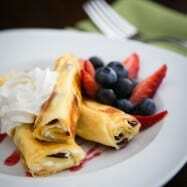 Melt about 1 Tbsp of butter in a skillet and sauté the filled crepes on medium heat until golden brown on both sides. They don’t take long to sauté. Be careful not to burn them. Serve with sour cream on the side. YUUUMMMM! 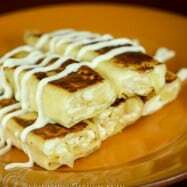 What is your favorite filling for Crepes (Nalisniki)? Do you like them sweet or meaty? 4 tbsp unsalted butter melted. + more to saute. Boil the eggs in a small pot until fully cooked through. Place in cold water to cool them down, then remove the shells. 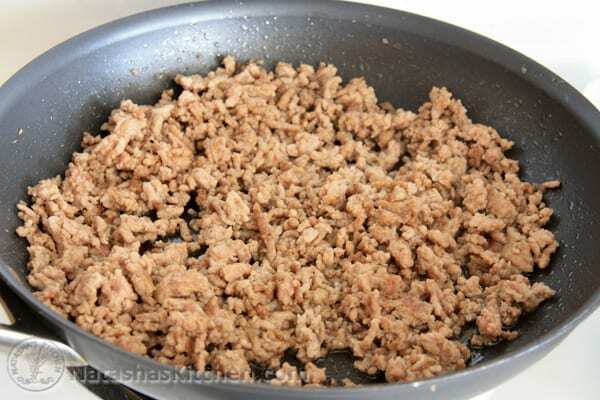 Saute pork with 1/2 tsp salt and 1/4 tsp pepper over medium high heat until lightly browned and fully cooked. No need to add oil. Remove to a large mixing bowl. In the same skillet, over medium/high heat, saute mushrooms and onions with 1/2 tsp salt and 1/4 tsp pepper. Add to the mixing bowl with meat. 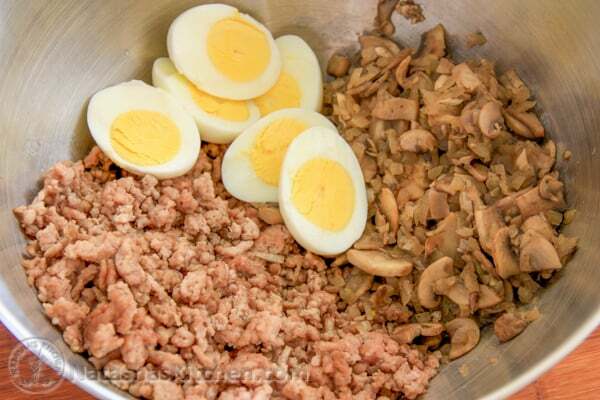 Add 3 boiled eggs to the bowl (cut them in half so they go through the meat grinder easier). 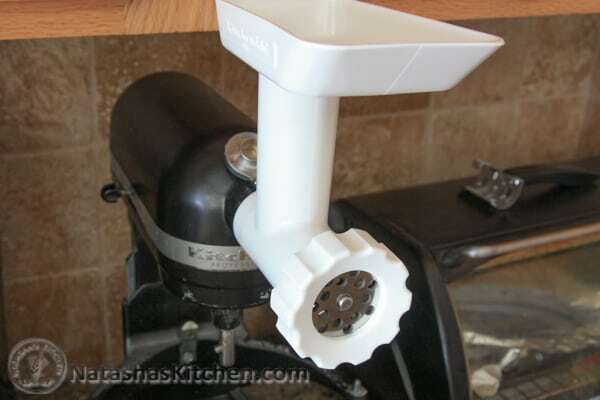 Push all of your filling ingredients through the meat grinder using medium blade. You can also use a food processor. Stir in 1 tbsp mayo OR water to make it a little more spreadable. 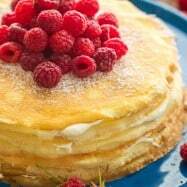 Put all of the ingredients for the crepes (in the order that they are listed: 1/2 cup warm water, 1 cup milk, 4 large eggs, 4 tbsp melted butter, 1 cup flour) in a blender and blend until well combined. Melt a dot of butter in 2 non-stick skillets over medium heat (2 skillets make the process go faster). Pour enough batter to cover almost half the bottom of the skillet and immediately swirl around to evenly coat the bottom of the pan. If you get any small gaps, you can fill them with more batter. 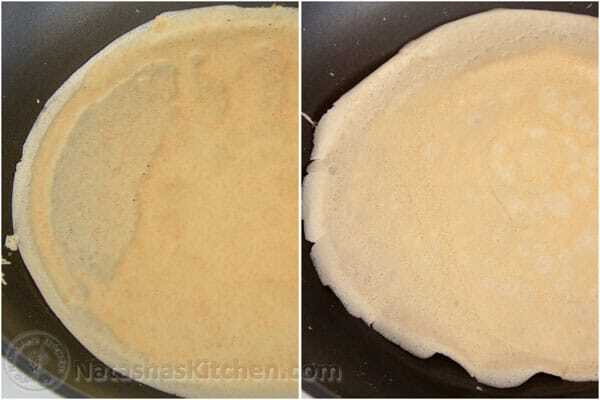 Once the bottom is barely golden, flip the crepe using a sharp edged spatula to easily get under the crepe. Let the other side get golden and plop the crepe out onto a cutting board. 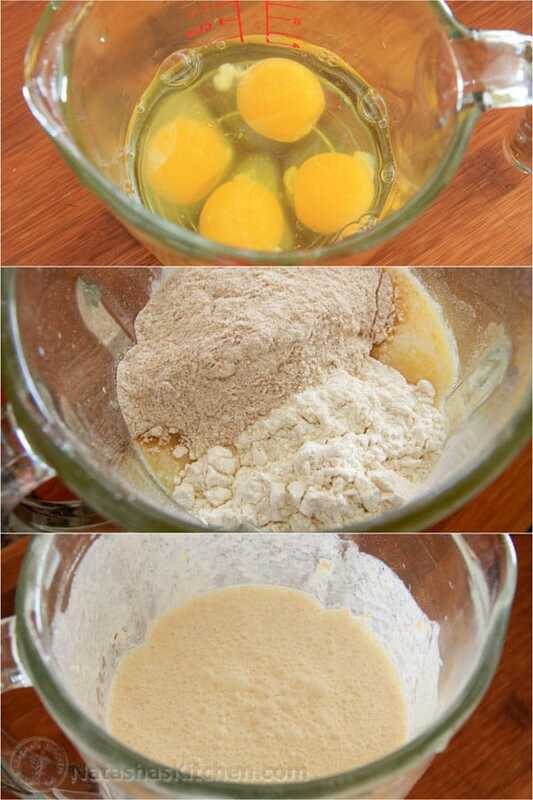 Repeat with all of the batter, using a dot of butter each time if needed (it all depends on your skillet). Don’t stack hot crepes on top of each other. Once they are just warm or room temp, they can be stacked. Add enough of the meat mix to be able to spread a thin layer on the crepe. Roll the crepes and cut in half if desired. Refrigerate crepes that aren’t being served. It keeps in the fridge for almost one week. Melt about 1 tablespoon of butter in a skillet and sauté the filled crepes on medium heat until golden brown on both sides. They don't take long to sauté. Be careful not to burn them. Serve with sour cream on the side. YUUUMMMM! 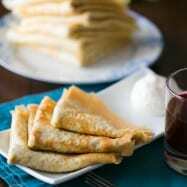 Do you know if I can substitute half of the flour with backwheat flour? These are sooo good! I’m making them again in advance and was wondering how long they stay fresh in the fridge? I made these last night and they were delicious! Dinner was a little late since this was a bit time consuming – but it was worth the wait. Next time I will plan ahead and pre-make the crepes and hard boiled eggs. Made these today, followed the recipe (I used Canadian flour). These turned out great. Also I fried pieces of pork and then put them through grinder with the rest of the ingredients from the recipe. Absolutely delicious. I made 2 batches. Natasha! You’re awesome! I love love love this recipe. My blini were delicious! 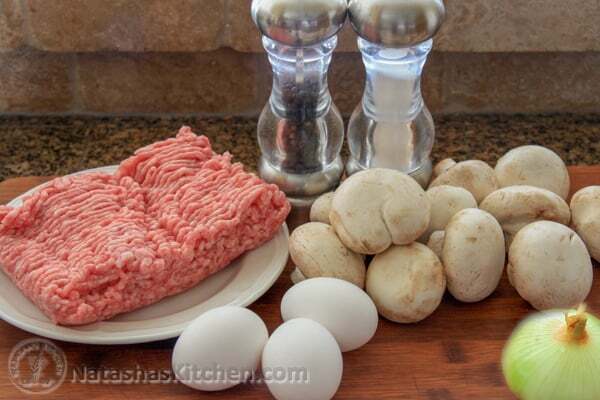 Love the mushroom and ground meat combo. Skye, I just chopped the meat and mushrooms with a knife to make them even smaller. I know it was kind of tedious but I don’t have a grinder . HELP! Any creative ways to grind it all together without a meat grinder? I would love to try this recipe today without having to go out and buy one. This is one of my favorite Russian recipes. I love making a whole bunch and making it for breakfast. Or serving it as an appetizer at parties. Delicious! Hi Natasha, these nalisniki look amazing. I make these but I never hear of boiled eggs in the meat, I’ll definately try these soon since my son and husband love these too:) Thanks for sharing. Do you have a good recipe for Rafaello cake? I bought some at the Russian store the other day and now trying to find a recipe.